In 639, during his exile on the Rialto, St Magno, Bishop of Oderzo, had a vision of the Virgin, where she appeared as a very buxom and beautiful (formosa) matron and ordered him to build a church wherever a little white cloud settled. It was the first Rialtine church dedicated to Mary, and was famously the parish church of the case-making guild or casselleri, who rescued the brides kidnapped by Dalmatian pirates; their reward was an annual visit by the Doge in the Feast of the Marys. In 1492, Mauro Codussi rebuilt the church, maintaining its original Greek cross shape; the exterior is by unknown hands. The Austrians dropped an incendiary bomb through it in 1916 (you can see a bas-relief of the bomb just outside the right transept door), after which the dome was repaired. The church has two façades, both to the greater glory of the Cappello clan, who paid for them. The one facing the canal is a military triumph dedicated to Vincenzo Cappello (d. 1541), a naval captain who defeated the Turks, with nary a religious symbol in view; and the one facing the campo honours even more Cappellos (and the Virgin Mary) built in 1604. 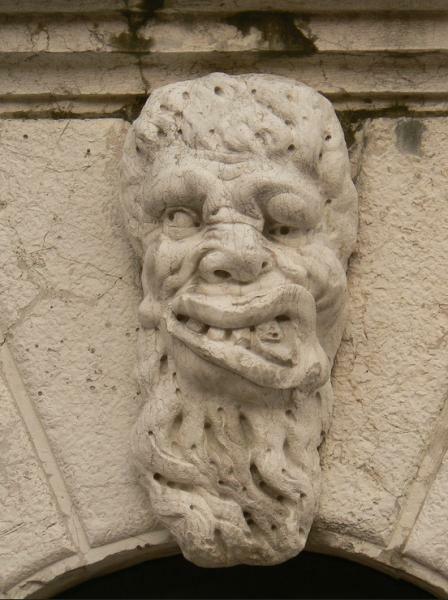 Leering in bestial degradation, too foul to be either pictured or described, or to be beheld for more than an instant...in that head is embodied the type of the evil spirit to which Venice was abandoned. Codussi’s grey and cream interior is another story altogether, a serene work of art in itself a complex variation on the Brunelleschian Renaissance archetype in Florence, with chapels divided by double open arches. If that mask is the ugliest face in Venice, many consider that of Palma Vecchio’s Santa Barbara (1524) in the Chapel of the Bombardiers (right transept) the most beautiful in the city, the perfectly ripe Venetian Renaissance beauty – modelled on the artist’s daughter. George Eliot saw her as ‘an almost unique presentation of a hero-woman’, and indeed, in her life, Barbara was so heroically stubborn that her own father had her locked in a tower and then martyred. She became patroness of artillerymen and bombardiers when her father was struck dead by lightning on his way home. The other major painting inside is Bartolomeo Vivarini’s sumptuously coloured triptych of the Madonna della Misericordia (1473) in the first chapel on the right; to her left are her parents, Joachim and Anne. The parishioners under the Virgin’s protective mantle earned their place there by paying for the painting. There's also a tondo attributed to the elusive Vicenzo Catena. To the right of the main door you can take in the shrine to Pius X, the Venetian patriarch who became the last pope to be canonized before John Paul II and John XXIII (another Venetian Patriarch) while on the left is an icon of the Virgin, carried on the admiral’s flagship during the Battle of Lepanto. Santa Maria Formosa sits in a lively campo with a market, several bars and pizzerie, and a handful of noble palaces: the Fondazione Querini-Stampalia, the Ca’ Malpiero Trevisan (No. 5250, with marble discs) by Sante Lombardo, the Veneto-Byzantine Palazzo Vitturi (No. 5246, with Byzantine carvings, and the 16th-century Palazzo Priuli. Santa Maria Formosa is a Chorus church.